One aisle inside a pilot store of Dutch supermarket chain Ekoplaza includes meat, rice, sauces, dairy, chocolate, cereals, fruit and vegetables - but no plastic packaging. Environmental campaign group A Plastic Planet, which came up with the idea, said the introduction of the world's first plastic-free aisle was a "landmark moment" for the global fight against plastic pollution. The issue of plastics polluting the oceans, where they can harm and kill wildlife, has shot up the agenda after it was highlighted in the BBC's flagship nature documentary series Blue Planet II. Earlier this year Prime Minister Theresa May outlined measures to tackle plastic waste in her Government's 25-year environment plan, including encouraging plastic-free supermarket aisles. Iceland has pledged to go plastic-free on all its own-brand packaging by 2023. And a survey for A Plastic Planet revealed last year that more than nine out of 10 British shoppers support the introduction of an aisle in supermarkets that has products free of plastic packaging. In the Netherlands, Ekoplaza will roll out plastic-free aisles across its 74 branches by the end of this year. The aisle will be used to test out new compostable bio-materials, as well as using traditional materials including glass, metal and cardboard, the scheme's backers said. 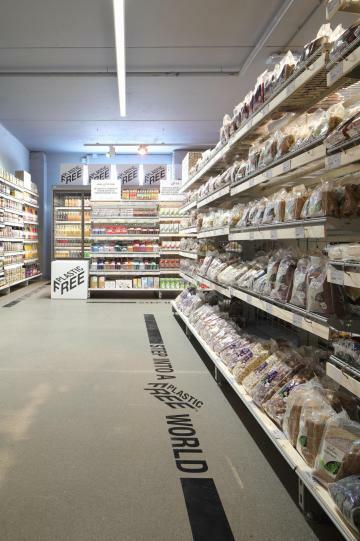 And goods within the aisle will carry the Plastic Free Mark, a label introduced by A Plastic Planet to help shoppers easily identify products that are completely free of plastic packaging. Ms Sutherland said: "The introduction of the world's first plastic-free aisle represents a landmark moment for the global fight against plastic pollution. "For decades shoppers have been sold the lie that we can't live without plastic in food and drink. A plastic-free aisle dispels all that. "Finally we can see a future where the public have a choice about whether to buy plastic or plastic-free. Right now we have no choice. "There is absolutely no logic in wrapping something as fleeting as food in something as indestructible as plastic. And she said: "Ekoplaza has set an example that the UK's supermarkets must follow at the earliest opportunity. Our biggest supermarkets must introduce plastic-free aisles urgently."